You DID it! You’ve made it to the final month of the Organize and Refine Your Home Challenge! As we wrap up the year, this month’s challenge topic — How to organize your finances — seems appropriate, don’t you think? After all, December is typically the month we spend money with reckless abandon. It’s also the time of year that we’re naturally inclined to review our financial situation as we head into a brand new year. This post contains affiliate links for your convenience (which means if you make a purchase after clicking a link I will earn a small commission, but it won’t cost you a penny more)! Click here to read my full disclosure policy. Everyone’s financial situation is different and varies in complexity. With that in mind, I’m going to cover some basic concepts that should be applicable to most people. Use my tips as a starting point, then consult with a financial advisor who can guide you based on the organized information you’ve put together. (Don’t have a financial advisor? Then I highly recommend Dave Ramsey’s Complete Guide to Money and Total Money Makeover books. My husband and I are Dave Ramsey disciples and have benefitted SO MUCH from his financial guidance over the years). 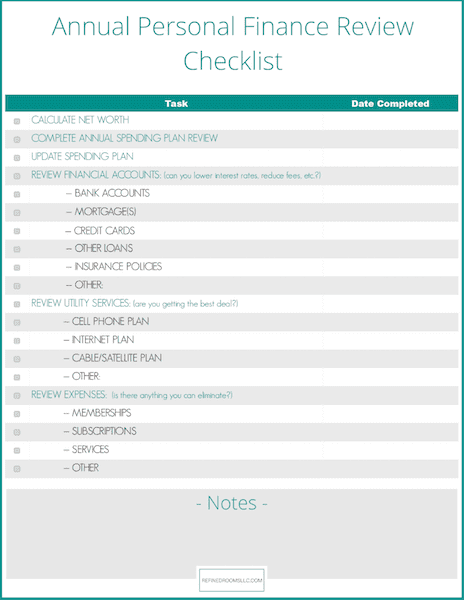 This post is geared toward those of you who prefer manual/paper organizing methods, but all of the steps can be completed using any of the above-mentioned digital personal finance tools as well. Liabilities (debts) include: mortgages, credit cards, car loans, personal loans, student loans, etc. It takes a bit of legwork to gather up all of the numbers needed to perform this basic calculation. To help you along in the process, I created a worksheet that you can use to record all of your raw data to calculate that magic number (read to the end of the post to learn how you can download a free copy for yourself). Since your net worth is a great overall barometer of your financial health, comparing your net worth from one year to the next is a good way to determine whether you are moving in the right direction. In order to properly manage your money, you need to first have a good understanding of your monthly cash flow. A monthly spending plan is the basic tool you need to track your cash flow. I prefer the term Monthly Spending Plan over Budget, because frankly I hate the idea of living within the confines of a set budget. It’s pure semantics I know, but somehow a spending plan sounds more fun, don’t you think?? You might already have a tried-and-true method for tracking your income and expenses from month to month. If so, great! If not (or you’re not loving your current method), consider exploring the budgeting tools included in one of the personal finance software options I mentioned above. 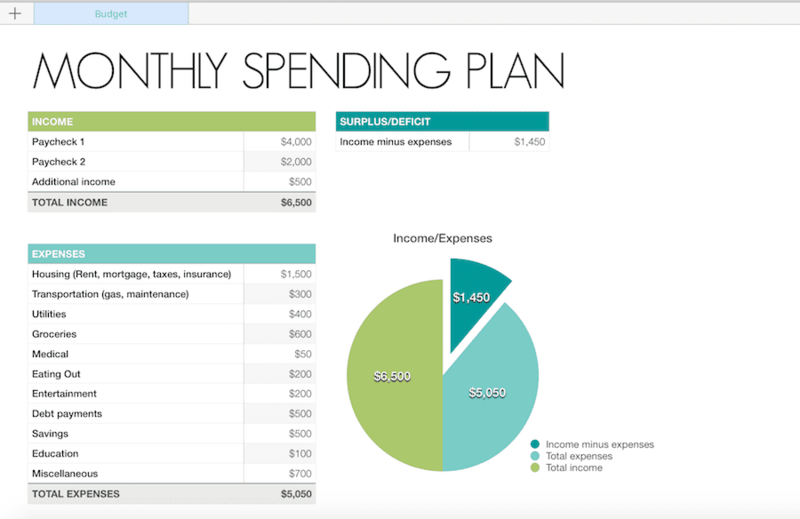 OR, if you want something super simple, I’m sharing my Monthly Spending Plan Template (created in Numbers for Mac) that we use in our household (read to the end of the post to learn how you can download your template for free). 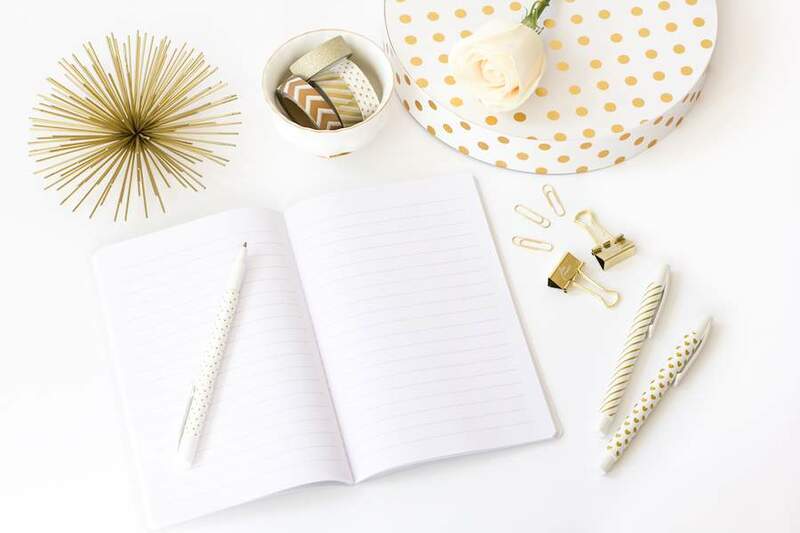 This is the one area that I strongly recommend using a digital organizing method over a paper method, since there are so many moving parts when it comes to tracking income and expenses each month. Paper & pencil tends to be really inefficient. I tend to make minor adjustments to our spending plan each month to include expenses that occur only in specific months (e.g., quarterly tax payments, holiday gifts, etc). But each year, I also complete a more comprehensive review of how well we stuck to our monthly plan. During the annual review, we make notes of which expense categories are regularly over or under what we’ve allocated in the plan. We then use that info to modify the spending plan for the coming year. This is also a great opportunity to review your list of expenses with an eye towards cutting out the fat. Ask yourself, “Is there anything in my list of expenses that I can eliminate?” Think underutilized memberships, unread magazine subscriptions, etc. And yes, I’ve created a printable to help with the annual spending plan review as well (see bottom of post to download your free copy). I’m always pleasantly surprised by how much money we save by tweaking things after the account review. We tend to not pay attention to the terms, interest rates, and fee increases associated with these financial accounts. That’s why planning a regular account review each year (or more frequently!) is a critical step in organizing your finances. The final step in the annual financial review process is to pull all of your credit reports and inspect them for errors. If you find incorrect information, it’s super important to correct those errors. You can do so by contacting the appropriate credit bureau and filing a dispute. In addition to looking for errors, it’s useful to know your current credit score so that you have an objective understanding of your “creditworthiness”. This information comes in handy if you have plans to refinance or secure any other type of loan in the coming year. Here’s more detailed information on how to get free credit reports each year. 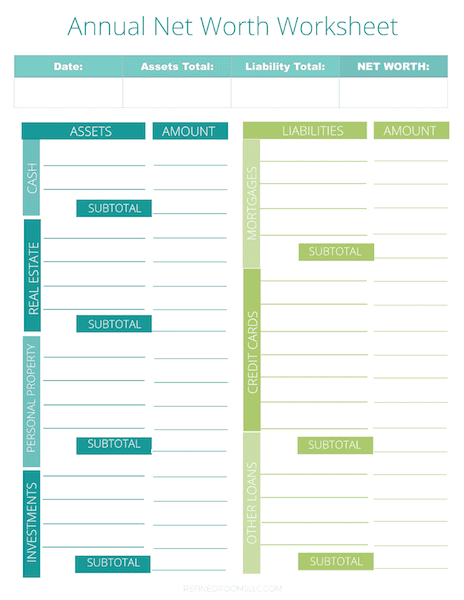 The Organize Your Finances printable set is FREE to all of my newsletter subscribers. To get the Annual Net Worth Worksheet, Monthly Spending Plan template, Annual Spending Plan Review Worksheet, and the Annual Personal Finance Review Checklist, all you have to do is subscribe to my email newsletter and you’ll gain instant access to my Resource Library (which includes all of these printables + so much more!). Hey, Natalie! 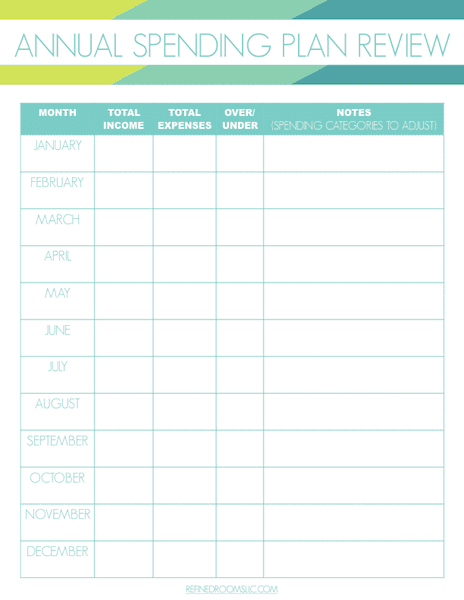 Just wanted to let you know that we loved your Organize Your Finances + Printables so much when you shared it at the #HomeMattersParty last week, we’ve FEATURED it THIS WEEK! Hope you can check it out when you get a sec. Happy Friday!!! Oh my, thanks so much Lorelai!! This is great information! Love how clearly you laid everything out. Thanks for linking up at Funtastic Friday! So glad you found it useful Liz!